Hyderabad: City-based startup DocOnline Health India Pvt Ltd, which has been founded by Swedish VCs and entrepreneurs Markus Moding and Johan Idemyr, announced the rollout of its services in Hyderabad. DocOnline is a virtual platform that operates via an app as well as website and provides access to unlimited doctor consulting services as well as home delivery of prescription medicines, diagnostic tests, and test kits. Describing the startup, which kicked off operations only in June this year, as an Indian company with a Swedish twist, Markus Moding, chief executive officer and co-founder, said the company was incorporated in December 2016 with an investment of $1million and plans to invest another $1 million for expanding its presence to other cities in the country over the next 12 months. DocOnline is a leading Online Doctor Consultation and Healthcare platform. When you or your loved ones are unwell, getting the right medical services quickly can be quite inconvenient. Given the long wait for an appointment with a doctor, getting to the clinic or hospital through the traffic, or even taking time out from your work can be quite harrowing. DocOnline makes health care easier by giving you immediate access to medical services like a consultation with GPs through your mobile phone, desktops or laptops – 6 days a week, 12 hours a day. 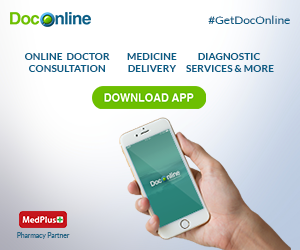 CONSULT A DOCTOR ONLINE – ANYTIME, ANYWHERE! DocOnline is an online doctor consultation platform that provides personalized doctor consultation services for Non-Emergency medical care. * DocOnline is a virtual platform currently operational in Hyderabad and Pune. * It provides easy access for a live chat with a doctor from anywhere. * Reaching a doctor is possible within 15 minutes. * One can book doctor appointment online immediately or schedule it as per convenience. * Upload Medical Records and get quick clear medical advice from Doctors. * Customers can avail consultations with doctors from the comfort of their homes for themselvesand their family members. * Talk to a Doctor in your preferred language. * DocOnline has 200 + experienced doctors registered with Medical Council of India. * DocOnline is one amongst the first Telemedicine company to become an ISO 9001:2015 certified.